We’ve talked about how to make peanut butter from scratch. But what about making nut milk from scratch? Well, as a matter of fact, no. And it wouldn’t be as fun. 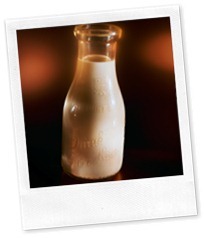 Depending on where you live, a quart of almond milk is probably around $3, give or take. For us, it’s $2.79. Making your own requires just a few ingredients and about 2 minutes. Are you sold yet? I am. There are lots of formulations for DIY almond milk out there, and this one is an adaption from Ani’s Raw Food Essentials. This formula will work for pretty much any nut milk – almond, pecan, cashew – whatever floats your boat or dunks your Oreo. 1/2 to 1 cup almonds, soaked in water overnight. I made a batch with 1/2 cup, and a separate batch with 1 cup. Both worked and I couldn’t tell a significant difference in taste between the two. The 1 cup version was just a little richer. 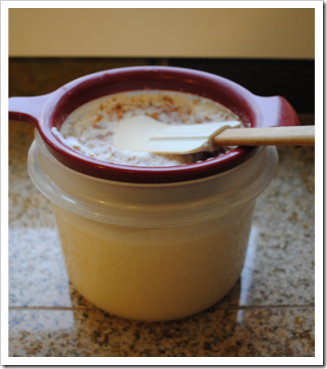 3 tablespoons honey, agave or even pure maple syrup. This is not essential if you are watching sugar, though it sure makes it good! You could scale it down, too, if you wanted a little sweet but not too much. 3-5 cups water, depending on how thick you want it. I went with 5 cups, as I am used to drinking skim milk. If you plan ahead and soak your almonds in the amount of water you intend to use, you can use the water you soaked the almonds in, as it will have all the almond “extract” in it. Add all the ingredients into your blender, and blend on “high” for 1-2 minutes. I blended on level “2” on the Ninja for about a minute. While you technically don’t have to do this step, I recommend it. Much like my little juicing experiment a while back, I felt it was necessary to strain the almond bits out of the liquid. After the straining, you’ll be left with nice clean almond milk. Store it in an airtight container in the fridge for up to 5 days. I am saving the “pulp” to use in oatmeal or recipes that call for almonds (after a quick taste test confirmed it still tastes like almonds). That means there is zero waste, as the plastic bag that the almonds came in went into the recycler. As a side note, this plastic container holds 8 cups of liquid so you can get a gauge of the volume output. For 2Chili’s sake, here is the cost breakdown, based on 1 cup of almonds and 5 cups of water. So, take that, 2Chili. Almost half price and more than double the fun! Believe it or not, I sent my husband out to buy that – was very pleased with him when he came home! 🙂 He bought it at Kohl’s… Good luck! Thanks for dropping by. I have never personally used dates as the sweetener, but you certainly could do so. Dates will need to be softened up a bit for this purpose so they blend nicely. I would take 2-3 dates (pitted) and chop them up roughly. Put them in a cup with about 1/4 cup of water (like a coffee mug would work) and heat in the microwave for 45 seconds or so. They should be nice and pliable at this point. Drain the water from them and add them to your mixture as you blend. The remainders will be strained out with the almond pulp. hmm, dates in almond milk as a sweetener sound sooo yummy. I keep meaning to try making my own nut milk. It’s on my 2012 list! Almond milk with dates sounds wonderful, think I’ll try it tomorrow. Just made this milk and it is delicious! My husband just bought me the Ninja Kitchen system 1200 a couple of weeks ago and I havent really decided if i like it enough to justify the expense. I couldnt really find a lot of reviews on it until somehow found your site and I am really excited! I think it may pay for itself after all. Thanks so much! The only thing about the milk is I dont have a really good strainer so there are still some almond bits in the milk but it tastes so good I dont care lol. Just got my ninja today and started searching for recipes. My lactose intolerant daughter will love tis. Do you think cheesecloth will work for straining? work. Give it a shot and let us know! I just got a Ninja and am anxious to get started. I’m an avid almond milk drinker so this will save me tons of money. Does it matter what kind of almonds? Roasted, raw? I usually by them in bulk at Sam’s. I’m a fan of the Cocoa Roast Almonds. Would those work? Thanks! I use raw almonds because there is a school of thought that roasting them makes them harder to digest, but there is no “real” reason why you couldn’t use your preferred Cocoa Roast Almonds. Go with what you like! Good luck and have fun! 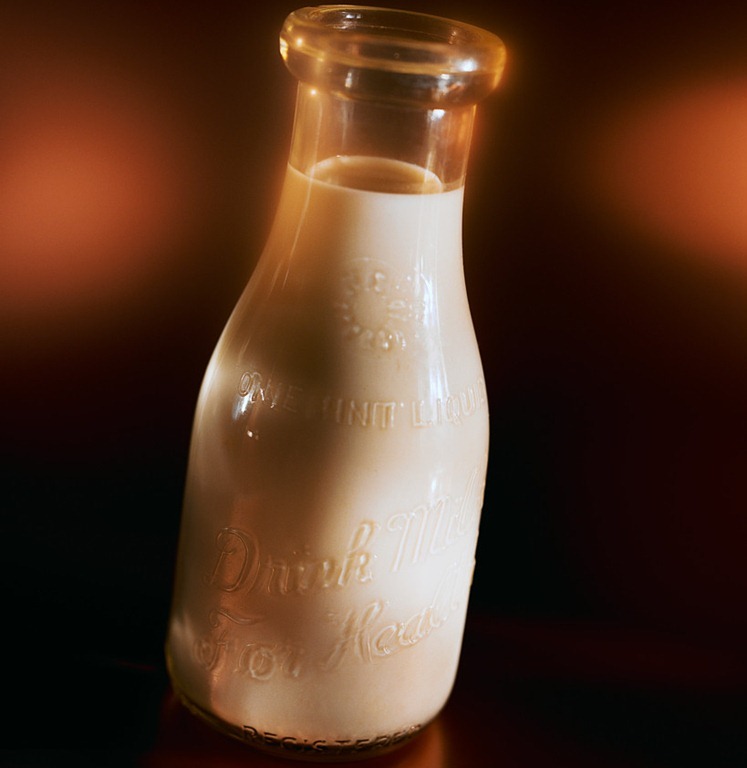 any suggestion on making flavored almond milk such as vanilla and at what point to put in the additive (for lack of a better term)? hehehe. I bought a Nut bag strainer, and am about to find out how hard it is to clean out after using it..
Love the recipe, Short and to the point.. And you can do a lot of variations with it.. I use a mesh Kitchen Aid Strainer, but have been thinking of getting a nut milk bag. 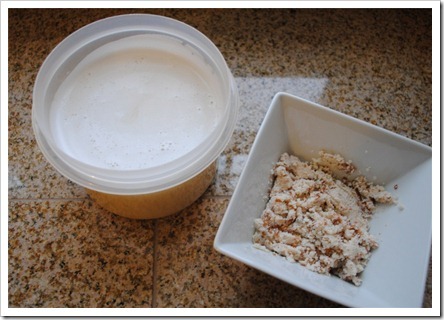 I just have never made the small investment, but I think you can definitely squeeze out more milk with the nut milk bag. Enjoy your fresh almond milk! I guess I could use a plastic glove..
HA, well, at least you know the culprit! 🙂 That is a great price on nut milk bags, and I agree that a plastic glove would probably solve your “wet hands” dilemma. Glad it worked out for you! I soak the almonds in the blender with the amount of water I am going to use, and next morn add the honey and blend away. Saves time! 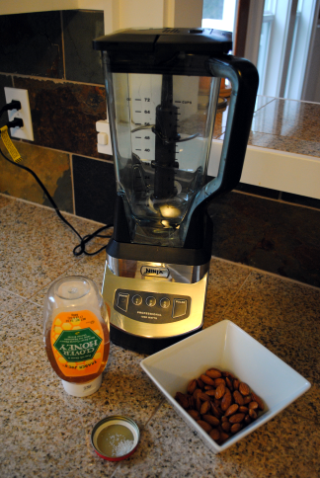 Great idea about putting the almonds and water right into the blender and soaking it all night long. just have to say …I’ve bought almond milk and ended up throwing it out….just bought my new Nija kitchen, was browsing and came across this site. The almond milk is DeLish !!!! saved the “meal” added it to my oatmeal along with some almond milk and you talk about nummie !!! The meal could be added to cookies, breads, meat loafs hamburgers etc etc….don’t just toss it as it’s great stuff ! Glad you found an almond milk you like. It’s fun to make, huh? I also like that you can use the leftover meal in many different things – I use it for all sorts of stuff. My mother-in-law sent me a Ninja for Christmas, and it very quickly became one of my new favorite kitchen toys (ranking right up there with my standing mix and bread maker). As my wife and I have been changing over to a more wholesome, from-scratch way of food preparation, I am appreciating the power of this tool. (Yes, a man who loves his power tools…even in the kitchen). I was just reading your postings about brown rice and garbanzo flours. Great ideas! Almond milk? I will have to try it. I stopped buying regular milk months ago because of the high cost for organic, to switch over to unsweetened almond, and have not missed it at all. I think the option for making it is a great idea, and even better is the option of recycling the almond “scraps” in other foods. Thank you Angela! Thanks for your note! Your MIL is a smart lady – that is a great gift! It’s funny – I had been drinking almond milk for some time before my husband tried it, always turning his nose up at the idea. I was still buying him organic skim milk until about three months ago, when he ran out of milk one morning, tried mine in his cereal, and realized he liked the almond just fine. He couldn’t tell the difference between almond milk and skim, and later asked me to stop buying the skim milk. If you like chocolate milk, you can add a bit of cocoa powder to your almond milk and get a much healthier chocolate milk option as well. I’m so excited I stumbled across your site! We’re moving to Africa soon and I will need to make my own almond milk since we don’t drink dairy and they don’t sell it there. Anyway, love this recipe and the ease of it! Just a clarification – did I read right that 1/2 cup of almonds can produce 8 cups of almond milk? That would be awesome if that’s the case! WOW! That is a big move. Congratulations on your impending journey and adventure. As far as the quantity, 1/2 cup of almonds can make about 3-5 cups of almond milk. If you don’t find it strong enough, you’ll need to bump up the almonds. The normal ratio is usually 1 cup of almonds to 4 cups of water, but, I like it just fine with only 1/2 cup of almonds. It’s sort of a personal preference thing. You can also add some sweetener with a pitted date or two or flavoring as you wish. First off, Angela, you have a new site fan — me! I found your site while searching for Ninja recipes, and found several goodies and tips here that I will be trying. Thank you! Second, I have a couple suggestions on the almond milk. I made my first batch this morning, and it worked out great. 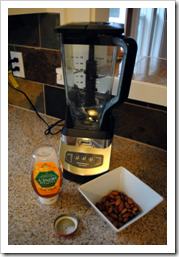 I used a previous suggestion of soaking the almonds directly in the water for the recipe, in the Ninja. (I have the Master Prep.) I used the 1 cup:4 cups ratio and that yielded 3.5 cups of milk (after straining). My first suggestion is regarding the straining “device”. I used a brand new nylon stocking (after washing it through with clean water and soap). That worked perfect!! That way I was able to squeeze out as much milk as possible, and now it can be washed (by hand with dish detergent if you don’t want to put it with clothes detergent in the washing machine). And when you feel you need another, use the other stocking in the pair! And buying packages of 10 pair at Walmart is cheap. The second suggestion is about the sweetener. I always buy Almond Breeze (plain or vanilla) UNsweetened almond milk (40 cal/serv). And then each time I use some I add a few drops of liquid stevia to get the desired sweetness, which doesn’t add calories. So when I made your recipe, I waited until the end to add sweetener so I could see how it tasted without it first. So my suggestion here is if you want to add some vanilla flavor, you can use the SweetLeaf Liquid Stevia Vanilla Creme flavor. (I used one dropper full for my 3.5 cups of milk, and that was good for my taste.) Or for stevia without flavoring, I HIGHLY recommend NuNaturals Clear Stevia. I’ve tried several brands of stevia, and this is the first one that didn’t have an aftertaste, and/or wasn’t bitter. It’s awesome!! I use it on/in anything that I want to sweeten. I had never used agave in my milk, so I put in about a Tbsp of that in my homemade batch too, and it gave it a little richer taste (as did the vanilla stevia), so that was a good tip for me too. But I try to be more careful with the agave as it does have calories, as opposed to stevia. Oh, and one more thing. I was really surprised at how much meal was yielded from the milk recipe, but that’s great — I will use it for other recipes. Any suggestions regarding drying it out and storing it for future use? Store-bought is dry and can be stored in the cupboard, but I’m thinking that even after I dry this out it should probably be kept in an air-tight container in the fridge. Yes, no, maybe so? Currently it’s spread out on a cookie sheet to dry at room temp. Sorry for the long ramble, but thank you and your fans for sharing so much good information! All great suggestions, thank you! 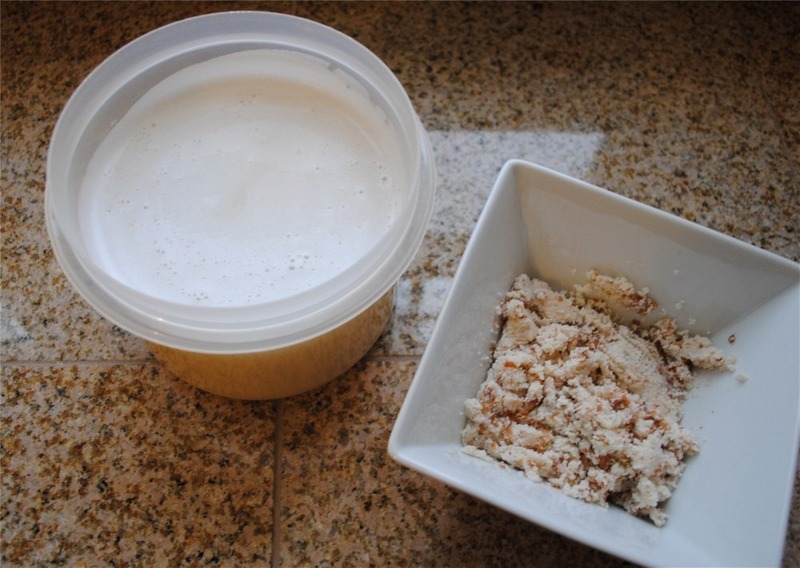 Indeed, a side benefit of making your own almond milk is the leftover meal, which is fairly expensive to buy outright, unless you have a Trader Joe’s. You could dry it many ways: In the oven at low heat on a cookie sheet (I don’t know how long this would take, probably 2-3 hours, so you’d want to keep an eye on it the first time), in the dehydrator on a jelly roll or Teflex tray, or, like you’re doing at room temperature (which will likely take some time). I would recommend the dehydrator if you have it – dry it out overnight and you’re good to go. You might want to “re-process” it after it’s dry before using as almond meal, to get a finer blend, though you don’t have to. You can store it in an airtight container in the freezer for many months (defrost before using), or in the fridge for about a week. If you don’t want to use it as flour, you could just put it into an airtight container as-is and add to oatmeal or other items. Hope that helps and thanks for your helpful note! 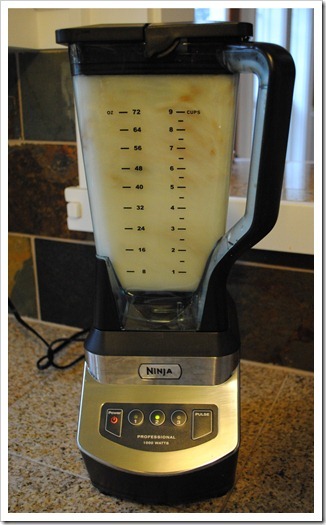 This is a fantastic recipe…I’m really looking forward to getting my Ninja blender, just so I can try this recipe. Thanks very much for posting this up. It worked! and I just put my water and nuts in the blender all night like someone suggested and used the same water. So very easy! Thank you for this recipe! So cheap and easy to make! If I can do this, anyone can. Trust me! Can this be done using the Ninja Pulse? 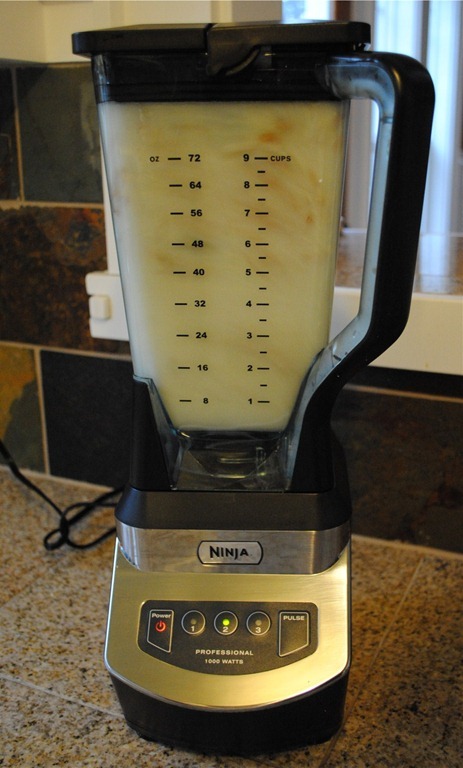 and if so do you have a recipe maybe for the 40 ounce container it comes with.. thank you for all the great ideas..
Hi – great recipe, just made it with my new Ninja. Do you happen to know the calorie/fat/carb count for this? I was not sure what to count as far as the almonds since the recipe is just basically using the water and straining the almonds. I am watching calorie/fat/carb and especially inflammation ratings on foods due to auto-immune conditions and was curious how to tally this one up. You know, I have never really been able to figure this one out because of exactly the reason you noted, but, I reckon it is similar to something like Trader Joe’s unsweetened almond milk, which has about 40 calories per 8 ounces, 2 grams of carbs, 1 gram of protein, and 3 grams fat. Thanks Angela, that’s what I thought. Again, great recipe and we also love the soft serve ice cream recipe too! might sound like a stupid question but…Just wondering if you are using raw almonds or roasted? Not a stupid question at all! I use raw, soaked almonds. You could certainly use roasted, but, in my opinion raw are “healthier” because they haven’t been exposed to high heat. But, whatever you have will technically work. I would still recommend soaking and rinsing them first, whichever you use. I have a 6 year old that is allergic to milk she takes her lunch everyday to school usually takes store bought almond milk. will be trying this out but can i send this in her lunch? She takes an ice pack in her lunch box will out stay good till lunch time? I just got the Ninja Ultima today i made a very unhealthy coffee drink and it came out very smooth i love it. Yes, absolutely. It will be just fine, especially with the ice pack. Great idea…i really like almond coconut milk. Thoughts on how to incorporate coconut into it? Soak it in the water overnight? or add coconut water during the blending? Open to suggestions. That is a great question! I would probably add it in with the blending after soaking. I think if you were to soak it, you might lose the coconut flavor with the discarded water. But, adding coconut water during blending is also a good idea. I would worry it might get too sweet with the coconut water, though. Please let me know what works out for you! FOR COCONUT MILK. if you can use a fresh Young (furry outer white shell) coconut. poke 2 holes with a cleaned screwdriver and drain into a cup or bowl. Open the coconut by hacking with a sharp butchers knife or kitchen ax type utensil, Once open scrape out all the white flesh and place inside a blender. remove all shell from the pulp. add the coconut water into the blender then. pulse and blend until smooth. Then strain through a “nut bag” and squeeze the liquid into a bowl. then you have coconut milk with all the flavor. you can use the ‘dry” pulp in your garden or wherever but it doesn’t have much flavor anymore.